Linda Ervine – Irish Language Development Officer for East Belfast Mission. Picture Declan Roughan 26 March 2013. Each year a guest speaker is invited to deliver a talk on either language, culture or identity under the banner of the Ned Maddrell Lecture, organised jointly by Culture Vannin and Yn Ҫheshaght Ghailckagh (The Manx Language Society) and will this year welcome Linda Ervine from the Turas Mission in East Belfast. Ms Ervine will discuss her personal journey with the Irish language, as well as revealing more about the work of the Turas Mission as it strives to connect those from Protestant communities with their history using the Irish language. 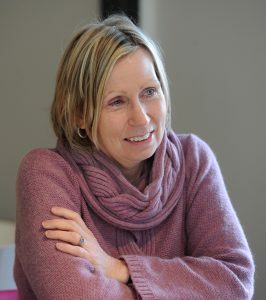 Both Ms Ervine and her colleagues will be staying on the island for several days, when it is hoped that a strong working relationship can be formed between the Turas Mission and Culture Vannin; with the aim of supporting the ongoing work of both organisations as they reach out to their respective communities. The annual Ned Maddrell Lecture will be held at 2.00pm on the 22nd July at the Tynwald Mills Conference Centre in St John’s. It’s a free event and open to all, but advance booking is required. For more information about the event, or to book a place for the talk, please contact Adrian Cain at adrian@culturevannin.im, or by phoning 01624 694753/07624 451098. ‹ Celtfest Isle of Man – A Fresh New Look for a Familiar Festival!